Europe based Tracked crushers and allied equipment manufacturer, Keestrack, displayed its B4e hybrid, diesel electric Jaw Crusher. 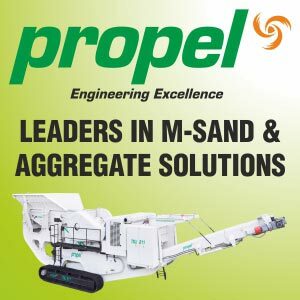 The company has drawn a business roadmap to tap the growing Indian tracked crushers market – both in the Construction aggregate and the Mining segments. Said Michael Brookshaw, Global Distribution Manager, Keestrack, "We are setting up a new plant at Neemrana in Haryana for manufacturing our tracked solutions. Simultaneously, We are in process of creating a very competent Indian Team and also lay due emphasis on training our associates & distributors so that they can extend the right product support to the customers." Swapan Das, the Managing Director of Keestracks Indian venture eTrack Crushers, added. "The Machines from the Indian Factory shall be re-engineered for Indian Applications, Rock Characters, our Climate and Operation Methods while keeping their unique characters intact which has made Keestrack as the fastest growing Mobile Crushing Plant company at this time; The reason why we chose Neemrana is because we have a sound vendor base in the region catering to a large number of heavy Construction & Mining equipment manufacturers like the JCB India and Metso, along with many allied sub-system manufacturing companies like Conveyors, Hydraulic Components, Castings and Rubber Parts"
Peter Hoogendoorn from the Hoogendoorn family which owns Keestrack Group and also a Director in this Indian Venture commented, " We, as investor are very convinced about the opportunities and growth that India offers as one of the future Major markets globally; therefore, we are very committed with our best resources for this Indian venture to make this Plant and the manufacturing standards at par with the company’s European manufacturing facilities and enhance this with time". It will be commissioned by January 2019, and the first product will be produced by March 2019. "We have registered our business entity in India and have also formed our core teams comprising of top industry professionals to extend the necessary technical support to produce our innovative and cost-competitive products from this new facility. Keestrack aims to sell 25-30 track units combining jaw, cone and screen from the new Indian facility during the First year and also plan to export them to Asia, Africa and Middle East markets," informed Brookshaw. Keestrack, which started its operations in India in 4th Quarter 2017, has already sold four units of its crushers in India during the past few months to create it’s footprints in the Industry before the products from Indian Factory enters the Market. According to Swapan Das: "Our tracked solutions deliver lowest cost per ton produced and a significantly higher availability. Machines are now required to be set up fast, must be available for continuous production and highly flexible for multi-mode operations to optimize between changing demands at various stages of the Project as project completion times have become very tight. Beside being a zero emission system, A unique feature of our hybrid design is our Non-Stop System and the drop box technology in the main engine. The engine power pack comes as a separate, alternate drop off engine unit. In case of any major repairs in the engine that can be easily dismounted and transported to the workshop. The plant can function normally with electricity feed from the grid / Gensets. The High quality components, efficient power transmission and advanced design features offer more efficient performance. Plus, the plant’s state-of-the-art design features, Telematics and intelligent system that delivers real time data on the working parameters of the plant to operators and owners." "Keestrack has targeted to reach annual sales of 85-90 units from its Indian facility by 2022", Said Swapan Das, "There is a huge potential here for Rock processing solutions in both fast tracked Construction industry as well as re-emerging Mining across the value chain; we plan to offer our other speciality products apart from jaws and cones and screens. M-sand, demolition & waste recycling will soon become a major part of our business target areas, besides loading, stocking, dust suppression special application based solutions."